Depth Constrained Cluster Analysis is an interactive plot applet, which was created to allow the user the ability to pick Zones from log data using digital Log ASCII Standard (LAS) version 2.0 & 3.0 files which are ordered along the dimensions of depth. 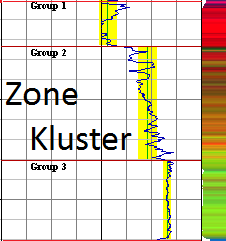 This constraint can be used to limit the analysis to the consideration of stratigraphically neighboring units, thus only vertically adjacent zones and clusters may be merged into larger clusters. Depth Constrained Cluster Analysis appeared in PfEFFER Pro an Excel Spread Sheet Program developed by the Kansas Geological Survey, released 1998. It also appeared in GEMINI ( Geo-Engineering Modeling through INternet Informatics ) web application developed by Kansas Geological Survey 2000 - 2003. The user can create Portable Network Graphics (PNG) images of the displayed plot. Applet Java Application accessible from the browser. Web Start Java Application initially downloaded using the browser, but can be run outside of the browser. Developing software takes time and effort. If you like our web tools and would like to help support future versions, please consider making a donation! Donations of all sizes are appreciated. We accept checks payable to the Kansas Geological Survey (KGS). Checks must be in US$ and drawn on a U.S. bank. To assist administration please add "Zone Kluster" in the "For" section of the check.